These four foots can be pulled up and placed next to 1-44-5. Verses from 2 to 10 have ekAnvayam. Brandishing his staff and mace that houses the death-bringing-goddess - kAla-yuktaM – mR^ityu devatA yuktam - maraNa prApikayA devatAyA yuktam; stood in the midst of the celestial army terrifying demons with his war-whooping. 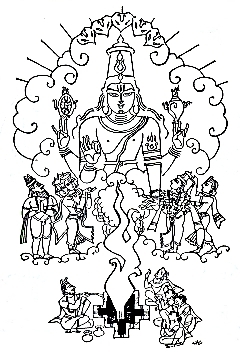 God yama is said to have come to war with his uncountable disease-battalion, namely aparimita vyAdhi parivAram. From here to verse 15 it is ekAnvayam. Finishing line: mounted on his eagle-vehicle garuDa... this is predicated in verse shrImAn... Aruhya 1-44-47. Thus, this is the forty-fourth chapter of first canto called harivamsha-parva, in harivamsha-purANa, the sequel of mahAbhArata, narrating the army of gods.